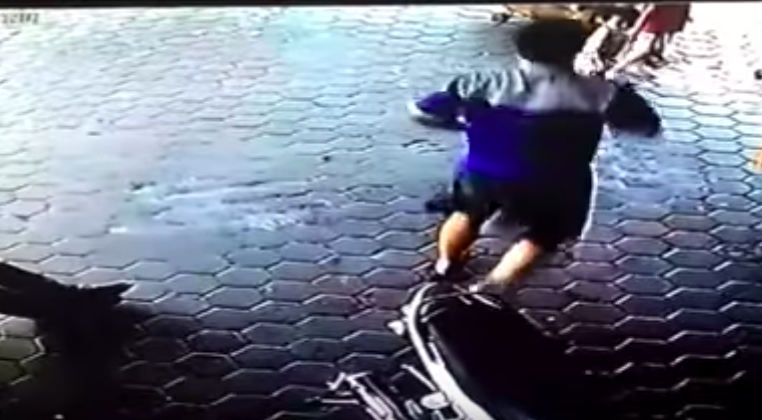 A video has gone viral of a dad saving his two children from being hit by a car with lightning-quick reflexes. 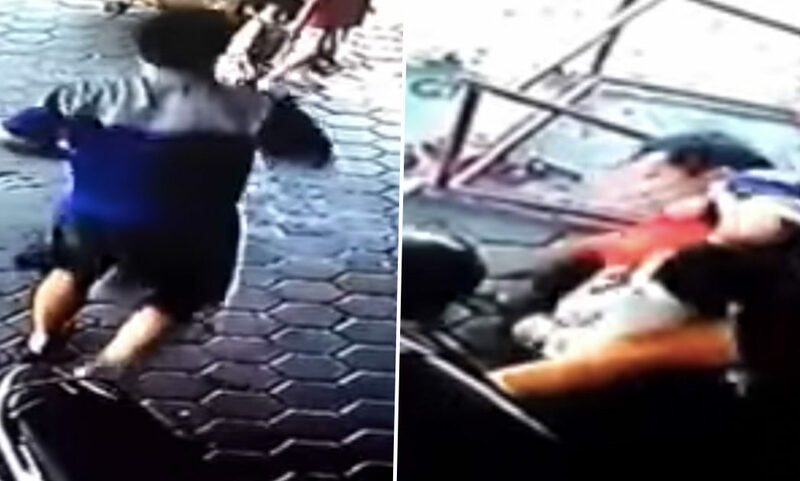 Back in 2016, on December 22 surveillance footage caught the moment the bike mechanic snapped into actiong, removing two kids from the path of a fast moving vehicle. In the area of South Jambi in Indonesia on the road Raden Wijaya at around 9am, the man can be seen attending to a bike when a Toyota car rushes past, rolling backwards, completely out of control. Like a scene out of a Hollywood movie, in a split second the man jumped into action putting his arm around the children who were playing around the garage dragging them out of the vehicle’s path. Fortunately his fearless actions saved them both. Initially posted by Gossip Village, a Taiwanese group on Facebook, the video has been shared thousands of times online. According to a report by the Jambi Tribune, the incident took place at a small local garage called the Selatan Jaya Motor. No injuries were reported. Police arrived soon after to carry out an investigation. Anwar Sutanto Chen, who released the surveillance footage, said the man in the video was a member of his staff and best friend. The internet was full of praise for the unknown hero when the footage went viral. I’m not even gonna lie, that dad is sick! Nice reflexes bro! Jesus Christ, this had me tearing up. OMG! That was so close! What if he hadn’t looked up when he did? I’m glad you and your children are ok. AWESOME save too! Earlier this year another father showed the same courage saving his son from a burning car. Driver Mike Jones lost control of his vehicle while racing at the South Boston Speedway in Virginia last month. Crashing into another car before spinning out of control, Mike’s vehicle eventually slammed into the wall of the track, bursting into flames. Mike was trapped inside for around 25 seconds before his dad Dean managed to pull him to safety. Witnessing the event, wearing only a t-shirt and jeans, Dean jumped over a fence legging it over to the car his son was in. Beating the safety team to the accident, Dean pulled Mike out through a window as the crowd applauded his actions. Despite knowing his son was safe, Dean returned to the car to help the track safety team put out the fire. 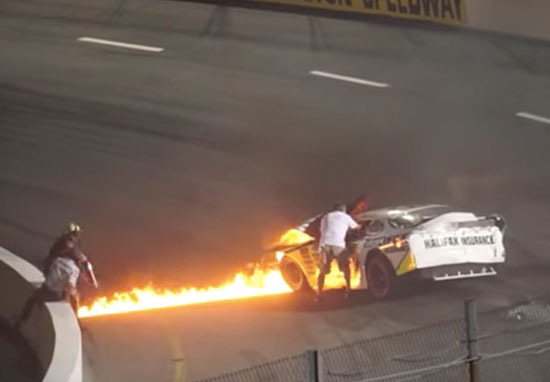 Mike remained unharmed from the accident but according to Motor1, Dean may have to face punishment from NASCAR for going onto the track and attempting to tackle the fire.